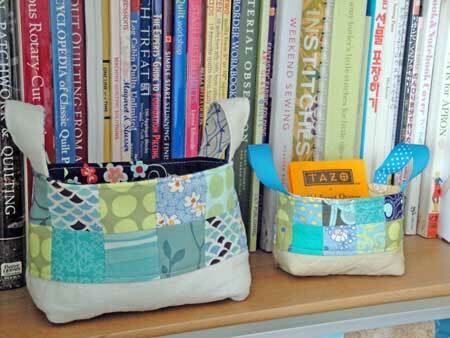 I felt like making one of Ayumi Mills' fabric baskets over the weekend. She has a great tutorial on her blog Pink Penguin, but typically I didn't pay close attention to the directions at first so I ended up with one itty-bitty fabric basket and one regular sized. The smaller one is made with 1.5" squares and the larger one is the regular version with 2" squares. Nova, over at a cuppa and a catch up, has a great post on using every little scrap of fabric to make a surprisingly large number of things. Making these baskets didn't do anything to diminish my scraps, but instead seemed to increase them like two loaves and five fish. The baskets are cute though. And I definitely have enough scraps to make a bunch of baskets for Christmas. and Easter. and birthdays. and anniversaries. and the random have-a-nice-day/thinking-of-you token.